From Ivy League prep, to post-modern grunge, students have always been at the forefront of fashion. Often balancing tight budgets against the aspirations of trend-conscious youth, students are renowned for being the first to adopt new styles or adapt existing ones. That’s particularly true of the revolution happening to what used to be thought of as sports or active-wear. With cutting-edge, high-tech fabrics offering better quality and sleeker, minimalist styles, a new generation of performance wear has left the stadium, headed for mainstream and, in the process, has redefined the way we think about casual wear. With an overall global market value expected to reach $126.30 billion next year, sales of performance wear are exploding. “Any retail space you look at, it’s a category that’s really expanding,” reports Lisa Loughan, Buyer for Barnes & Noble College, which manages over 700 campus stores nationwide. That trend couldn’t be more evident than in the campus stores she buys for, and where she’s predicting no slowdown of the phenomenal 32 percent growth the category experienced last year. “We’ve carried brands like Under Armour in our stores for many years, but now we’re developing the category by providing our students with access to the same brands, same fabrics and same silhouettes found in major retailers, giving it even greater relevance by making it available with their school logo,” she adds. Now joined by fitness giants like Nike and Champion, sustaining that kind of growth is requiring some changes at the store level. “We’re transitioning the selling floors in our bookstores to streamline some of our bestselling cotton graphics and offering more product in the performance category,” Loughan explains. 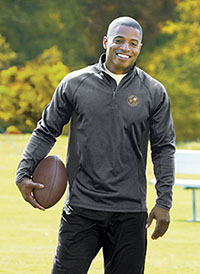 And while cotton sports apparel still accounts for substantial sales for Barnes & Noble College — particularly appealing to alumni and parents — it’s a product being eclipsed by the shift away from the traditional collegiate look to more modern and versatile fabrics. 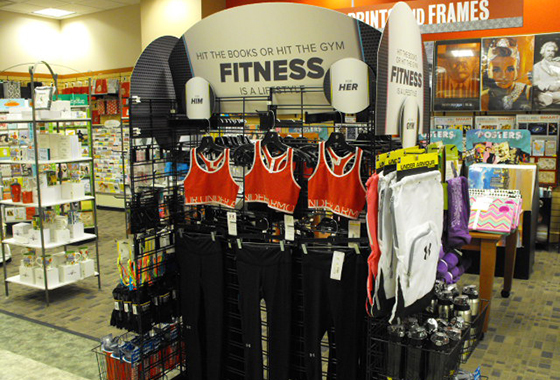 A fitness display that includes performance apparel in the Barnes & Noble – The Ohio State University Bookstore in Columbus, Ohio. It’s not always easy to separate the growing movement for increased fitness from the phenomena of performance wear solely as a fashion trend. Although the design elements behind performance wear are intended to cater to activities ranging from yoga to athletics, the consumer is increasingly using that product for more stylish reasons. Surveys repeatedly point to a consumer preference for performance wear as around-the-house clothing, equally well-suited for doing chores, attending classes or meeting friends for intense workouts. But it’s a trend that has endless possibilities.